Keep cool and eat ice cream. A warm gooey cookie served fresh from the oven is one of life's biggest pleasures. As is a scoop of homemade, luscious ice cream. 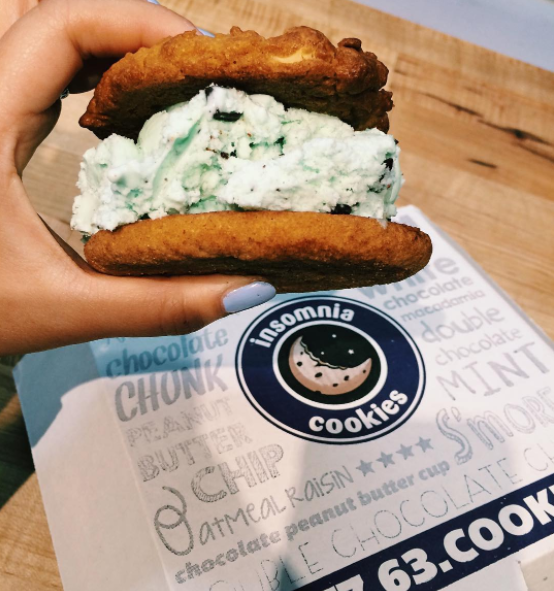 So when you put them both together in the form of an ice cream sandwich, you've got the best of both worlds. But where do you find the absolute ~best~ dessert sammies? We asked the crew at Yelp to round up their favorites. They sourced these from their community managers across the country — who love frozen treats (and eating local!) — just as much as you do. 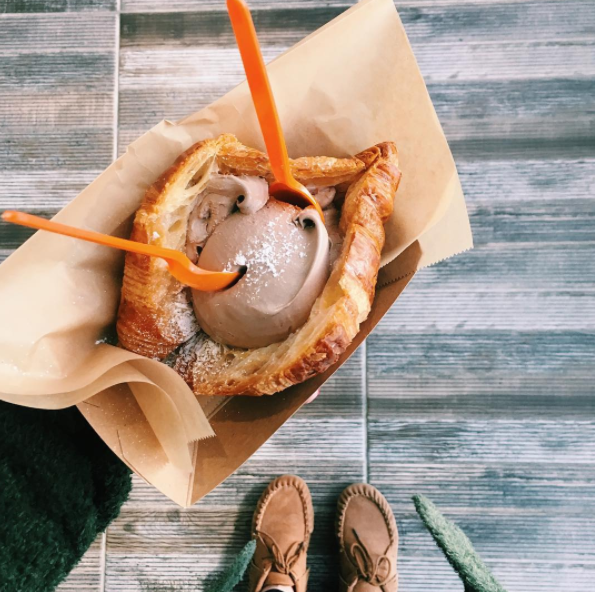 Take your pick from Oddfellow's extensive ice cream menu, then have your scoop stuffed into a brioche bun, warmed on a panini press, and garnished with toppings. When in Cambridge, order this frozen take on the canoli. It's lemon ricotta gelato dipped in chocolate, rolled in pistachios and seved in a homemade cannoli shell. 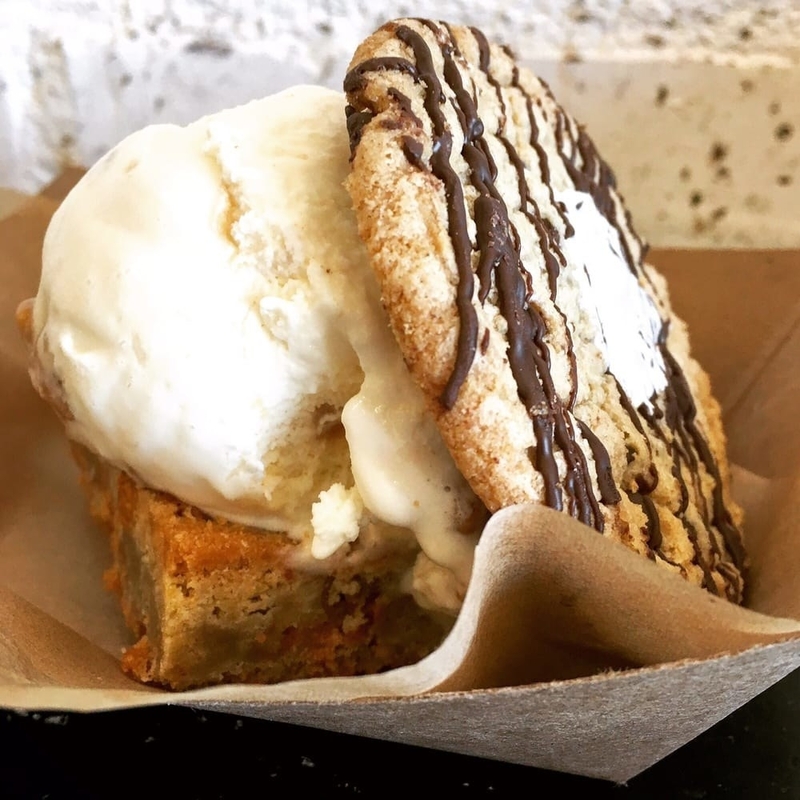 This Houston favorite offers two rotating specials to help hungry customers get through the week: Waffle Ice Cream sandwiches on Wednesdays and Churro ice cream sandwiches on Fridays. 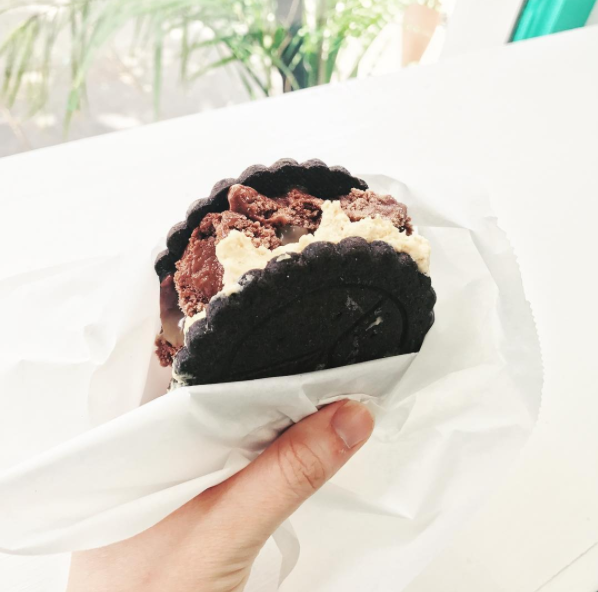 This artisanal ice cream shop with five locations around Los Angeles turns its small batch flavors into mouthwatering ice cream sandwiches. Think: "Blueberry Muffin" and "Summer Corn" wedged between two chocolate-dipped wafer cookies. There's no better way to satisfy a sweet tooth than with this OKC creation made with cookies 'n cream ice cream sandwiched between two chocolate chip cookies. Imagine your favorite childhood PB&J sandwich in the form of a frozen treat. Yeah...It's just as good as you'd expect it to be. 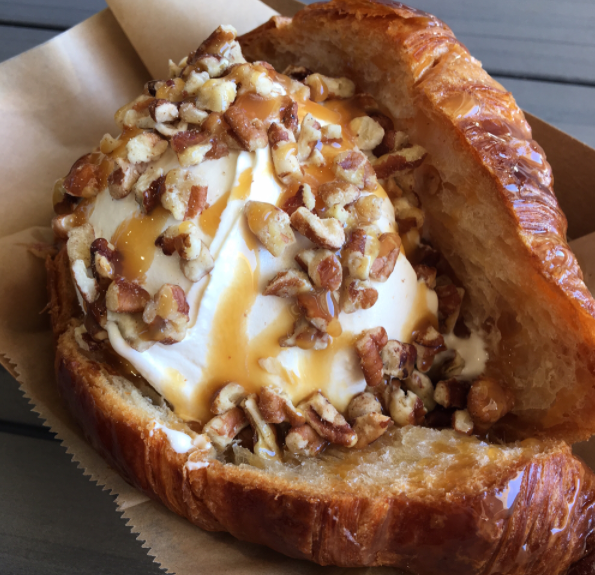 The signature dish at this Denver creamery, the Gooey Cooie, features a brioche doughnut, split open and filled with homemade ice cream. The whole thing creation gets pressed together in a panini machine and topped wth icing glaze. University of Maryland students know the secret to surviving finals week, and it includes lots of these decadent ice cream sandwiches stuffed between freshly baked cookies. Choose from the Cookiewich (an M&M cookies) and the Bigwich (classic chocolate chip). There's only one main attraction at this Jersey mainstay: A scoop of your favorite ice cream flavor stuffed between a glazed doughnut bun. 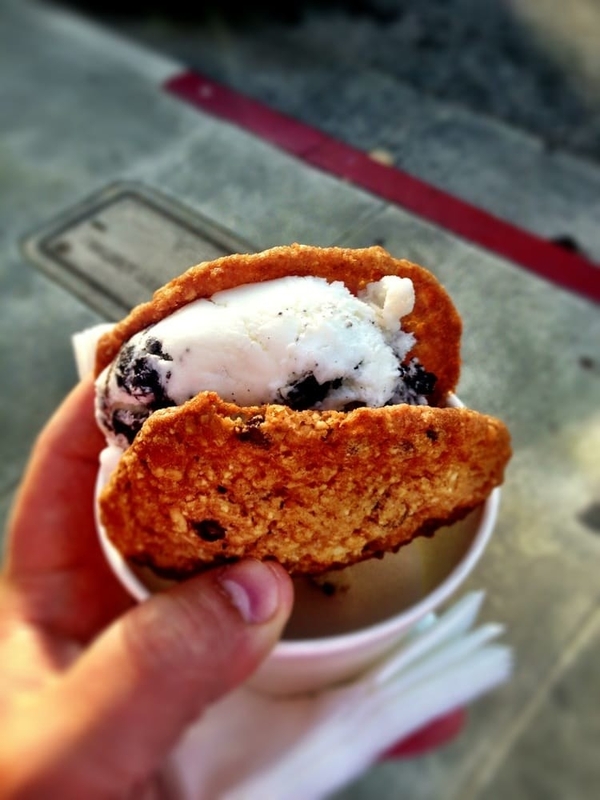 The king of gourmet ice cream sandwiches, Coolhaus is a fleet of ice cream trucks around L.A, Dallas, and NYC. You can choose from eight artisanal sammies, including double chocolate cookies filled with mint chip ice cream and snickerdoodle cookies stuffed with salted caramel ice cream. If you've never had ube — or purple yam — ice cream before, you're missing out. 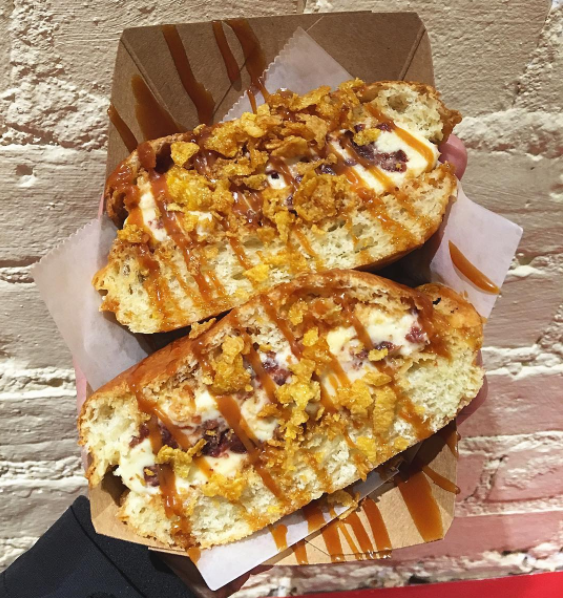 At Bonifacio, a Filipino restaurant, it comes served on a fried bun with coconut caramel sauce and Fruity Pebbles. These hot-pressed glazed doughnut buns stuffed with ice cream and garnished with your favorite toppings are the ultimate way to cool off in the Texas heat. Looking for strawberry cheesecake ice cream with Cap'n Crunch cereal? No problem. Sooo, this counts as breakfast right? 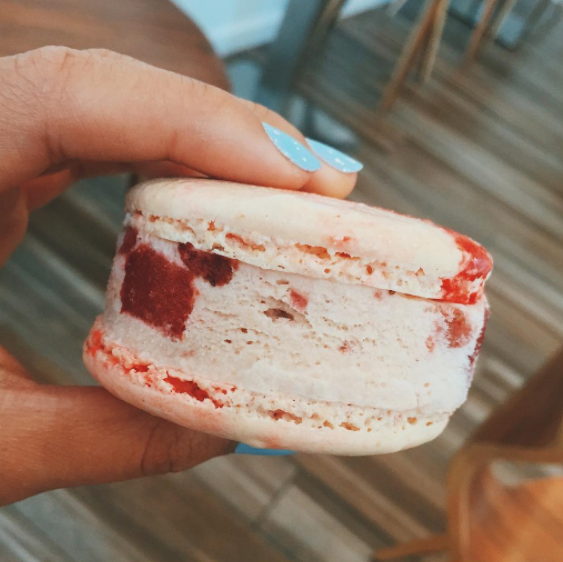 This Bethesda pastry shop turned its already popular French macarons into delectable ice cream creations. 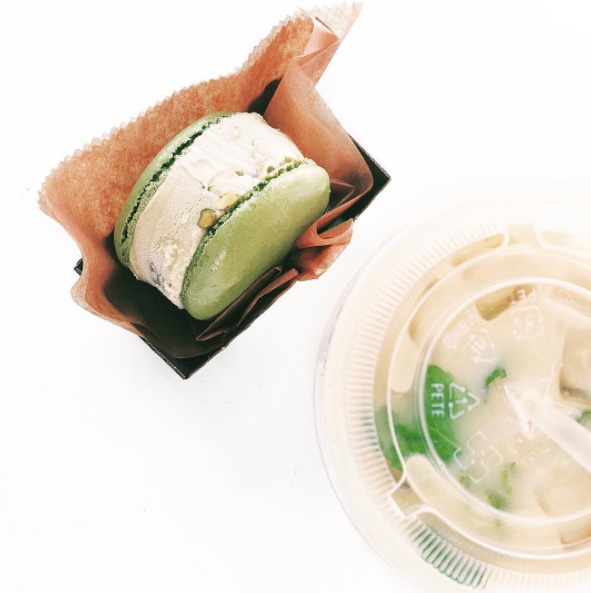 You'll find these treats in interesting flavors like coconut macaroons with mango sorbet and strawberry macarons with green tea ice cream. Not to be confused with ice cream, custard is even thicker and denser, made with egg yolks and butterfat. If you find yourself in the Detroit area, make sure to try it sandwiched between two warm waffles. Come for the pastrami sandwiches and stay for the decadent ice cream sandwiches at this butcher and pastry shop. Just don't miss the strawberry and pistachio praline frozen sammie. Introducing: Ice cream sandwiches with a layer of pie filling...because God is god. 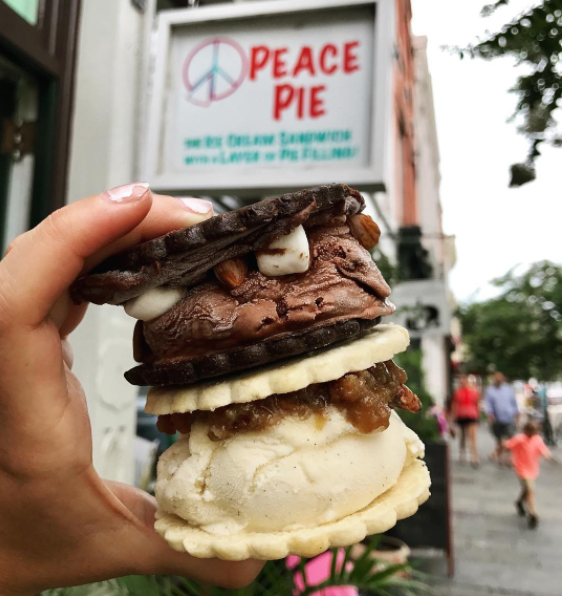 Peace Pie offers over two dozen flavors like salted caramel ice cream with apple pie and cheesecake ice cream with tart cherry pie. It's like your favorite store-bought choco taco, but so. much. better. Choose from a bunch of ice cream flavors, which are stuffed in a waffle cone taco shell and topped with chocolate. If you've never tried a concha before, it's a Mexican pastry that's basically a sweet roll topped with cookie crust. And it tastes even more delicious topped with a scoop of ice cream. The macaron flavors change daily at this pastry shop just outside of D.C., so you'll have to go often to get your hands on all the flavors. 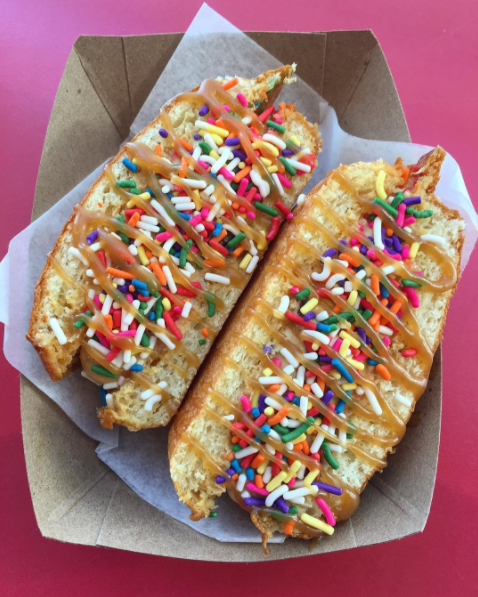 Fried dough + ice cream = dessert goals. Start with the matzo ball soup at this haute Jewish deli, and finish off strong with the chocolate babka sandwich filled with vanilla bean gelato. You may never settle for a waffle cone again. This upscale eatery serves farm-to-table southern fare, but locals know the dessert menu is the real star of the show. The ice cream sandwiches are only available during lunch time, and the flavors change daily. Why settle for ordinary macarons when you can have them filled with gelato? It doesn't have to be your birthday to treat yourself to this rich and creamy sprinkle-topped sammie. This Instagram sensation is well worth all the hype. It's two freshly basked, cinnamon sugar-dusted churro disks filled with your choice of ice cream (like strawberry buttermilk or Spanish latte). 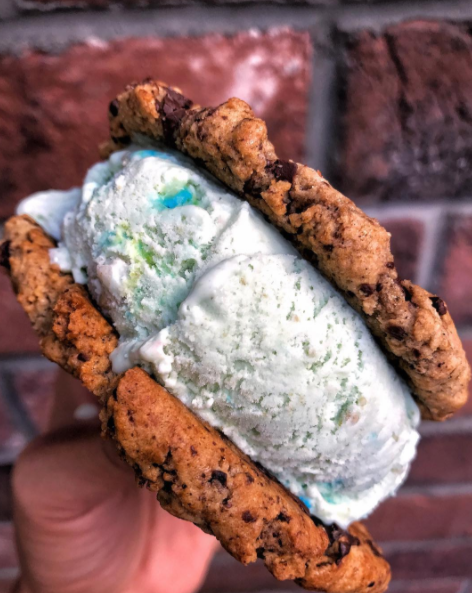 Customers can choose between eight different ice cream sandwich offerings, like "The Notorious PBC," with double chocolate cookie and peanut butter ice cream or "The Breakfast Sandwich," made with oatmeal cookies and coffee ice cream. 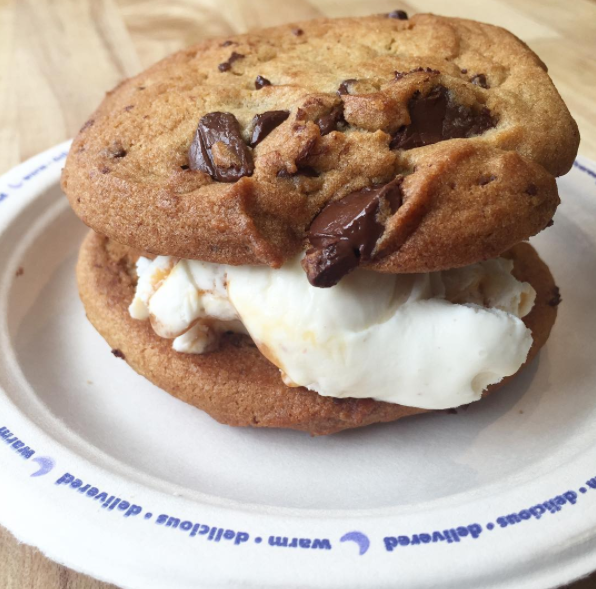 $7 for an ice cream sandwich may sound like a hefty price tag, but one bite of these homemade, melt-in-your-mouth cookies filled with artisanal ice cream and it'll be worth every penny. Flakey croissant, meet luscious ice cream. 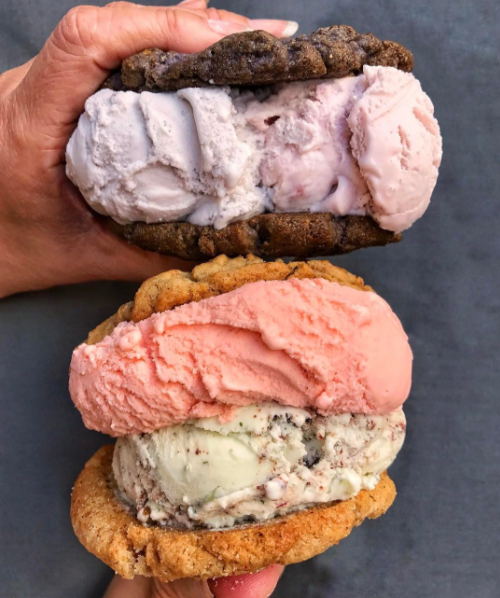 The handmade ice cream sandwiches at this Portland favorite come in eight flavors like lemon cookies with honey lavender ice cream and brown sugar cookies with Oregon strawberry ice cream. These stuffed sandwiches are made with fresh doughnuts from nearby favorite, Glam Doll Doughnuts. Head to this cuban shop for a bocadito de helado. The main difference between the ice cream sandwiches you're probably used to is the bread. Tio Colo's version serves theirs between two slices of sweet and dense yellow sponge cake. This sweet-and-salty treat features chocolate Chip Sea Salt cookies and vanilla ice cream all rolled in bourbon caramel corn. This craft ice cream shop with locations in Los Angeles and Orange County is known for its "samiches." You can even mix and match two types of cookies with two flavors of ice cream inside.